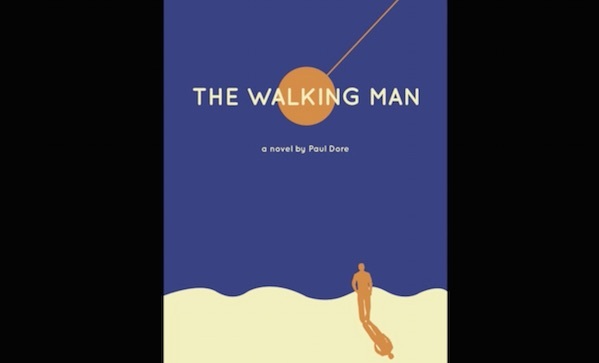 At the beginning of the Walking Man, the eponymous walking man is very nearly author Paul Dore, fifteen-year veteran of film and television, and he is walking alone in the Jordan desert, having lost his travel companions over the dunes and lost himself somewhere in his thoughts. It is aimless, stark, and lonesome. “Excuse me for this long diatribe,” he implores the reader. And it is a diatribe. Much of the time, alter-Dore is wrapped up in his own head, figuring himself out on the page. “I’m a good worker,” he tells us, “So what am I afraid of? I’m afraid of people finding out that I’m a fraud. Whoa, I just wrote that without even thinking about it. A fraud?” This intense self-awareness and occasional attention to the minutiae of his daily life wouldn’t be out of place in, say a Tao Lin novel. But reality keeps fracturing. Most notably, alter-Dore’s inner critic, one-armed ghost, disappears when he meets the novel’s other most-fleshed out character, the one-armed, chain-smoking, wrestling-watch nonagenarian Mary. As desperately as alter-Dore clings to deeply-reflective stream-of-consciousness, the rest of the novel can’t help but pull him into the kind of story we used to read in a pre-irony world: one with characters, impossibilities, metaphors. By the end of the Walking Man, said walking man doesn’t seem to be as much Paul Dore as before—a diminished alter-Dore—and he’s walking from Toronto to Niagara. This walk couldn’t be further from his lonesome walk in the desert. He’s walking with a purpose, through a rich landscape, surrounded (and beset) by a supporting cast. In a sense, Dore’s work is deeply self-indulgent. I’d feel bad about saying so, except that Dore says as much himself. Or alter-Dore does, anyway. I hope writing the Walking Man was a cathartic experience. That said, Dore struggles valiantly with the problem every modern writer faces: after post-modernism, after self-awareness, after the many layers of meta-this and meta-that, can we go back to telling stories? Can an author escape his own head and become a character? Truthfully, I’m not sure that the answer the Walking Man presents us with is yes. But I admire the struggle.